Planning a trip to Disneyland and looking for a nostalgic experience? Watch this video for fun a look at each of our picks. This is one in a series of Challenge videos, in which our team of Expedia Viewfinders brings you the best of everything you need to know to plan an outstanding visit to Disneyland. Traveling with kids? Solo? Just the adults? For a celebration? We’ve got you covered with tips and tricks that will appeal to you no matter your travel style. To view all of the videos, check out Facebook and our YouTube channel. Ready to book? Use our award-winning app or head to Expedia.com/Disney for all of the tools you need to plan an epic Disney adventure. What are your favorite classic attractions at Disneyland? Making the most of midlife! Join hosts Sandi and Rick as they take you on a fun filled journey to meet amazing people, visit interesting places, taste incredible food, attempt new challenges and experience all that life has to offer. 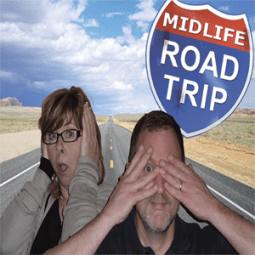 After all, the Midlife Road Trip is the perfect therapy for a midlife crisis!